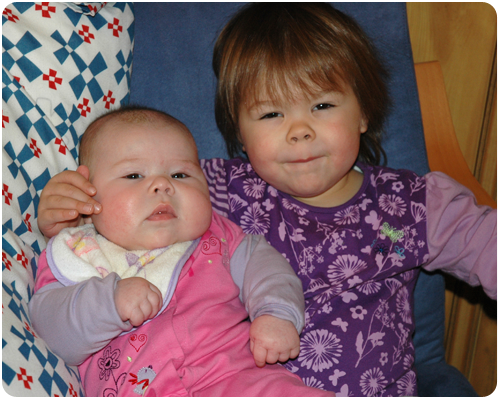 This is one of my all-time favorite pictures of my girls, and I am so happy that I found it. I have spent the better part of the last two weeks organizing our digital photos. Prior to me taking on this project we simply uploaded our photos and stored them in folders labelled with the upload date. Because we have 3 cameras, this led to pictures from the same event ending up in different folders depending on when we cleared off the different cameras. It probably goes without saying that this made it incredibly difficult to find all the pictures from one specific event, or a specific photo that I was looking for. Now things are so much better! I organized all the photos by year, month and then event. So, for example, photos from our trip to Ottawa in November of 2009 are organized by: Year: 2009; Month: 11-November; Event: Ottawa. This new system is working fantastically for us. While this was undoubtedly a huge project (much more so than I had originally anticipated), it was so incredibly worth it. I LOVE photographs. Of course I knew this, but as I sat at my computer for hours sorting, labelling, and organizing our photos I was transfixed. The memories, the changes in my girls from when they were babies to now, the smiles and laughs, unforgettable past events....seeing these pictures reaffirmed for me how much I love photographs and how incredibly precious they are. We take an incredible number of photographs. And we have taken the majority of these since our girls were born (not such a big surprise!). Before the girls there were vacation photos, and the odd random shot of everyday stuff, but after the birth of our girls, our photo-taking exploded exponentially. It is fantastic! I am so happy that this is the case and that our girls will be able to look back and see their pasts in these photographs. Organizing our digital photos in a way that makes sense for our family was essential. This has made looking back and finding specific photos much easier; which after all is the point - to have our photos accessible and easy to share. In working through this project I have found treasured photos that I want to put in frames and display around the house, pictures that I need to print and send to grandparents...and now I know where they all are and sharing them will be much simpler. 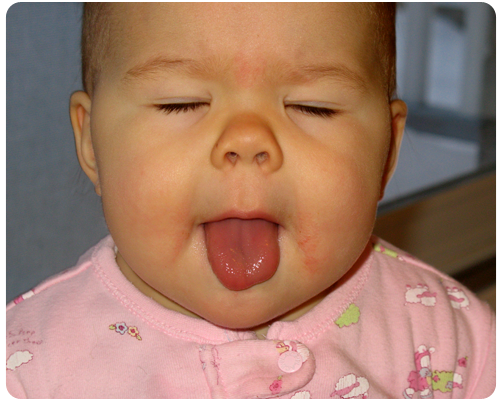 This is my oldest daughter, Bridget when she was just shy of one year old - so hilarious! 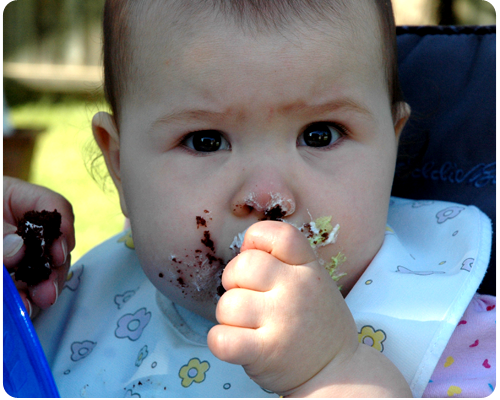 And this is my youngest daughter, Claire, enjoying her cake at her first birthday party. Aren't these girls the cutest? 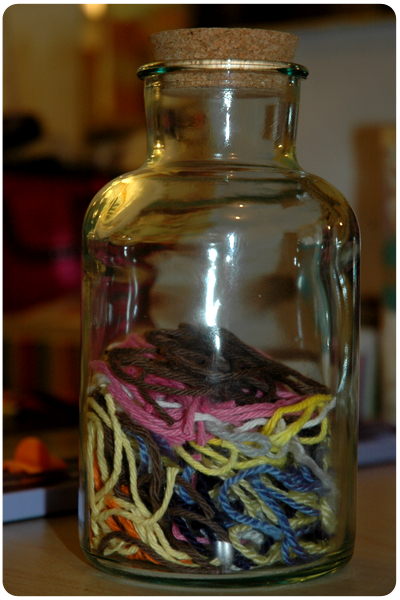 How do you organize your digital photographs? My greatest card making challenge is creating cards that would be suitable for boys or men. As the mother of two girls, my scrapbooking supplies are overflowing with pink and purple patterned papers, flowers, ribbons, jewels and all other things girly. Not really the stuff you would necessarily want on a card for your husband or father. When I sit down to make cards I have to make a conscious effort to make a few that are male-orientated. No pink. No flowers. Nothing girly. I am ready for the next guy in my family to have a birthday. 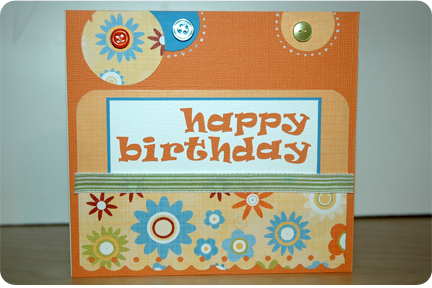 Scraps are perfect for making cards. 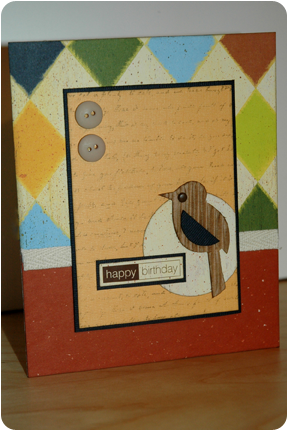 Almost every card I create is made from scraps in my stash. I can not even count the number of times that rummaging through my scrap stash has revealed the perfect colour cardstock for an embellishment on either a layout or card. It saves me money. I don't need to buy an entire sheet of paper, I can just use what I have leftover from a previous project. Of course, the downside of all of this is that I have a lot of scrap paper that I need to both organize and store. 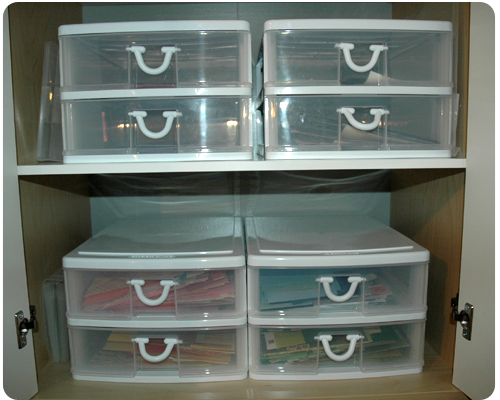 I used to keep my scraps in large expandable folders, but the folders soon got incredibly bulky and the small pieces of paper fell to the bottom where I could never see them. So I changed to a drawer-unit storage system. I bought 4 of these 2-drawer units at Walmart a few years ago for about $10 each. Lucky for me, they fit perfectly onto the shelves in my craft cupboard. 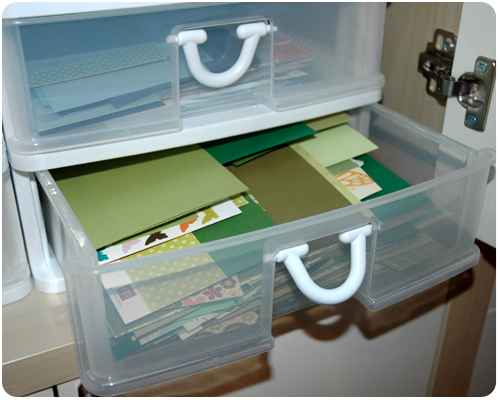 I organize my paper scraps by colour in the eight drawers: blue; pink; green; red; orange/yellow; brown; purple; black. This system works perfectly for me. The drawers open completely so that I can see what I have. 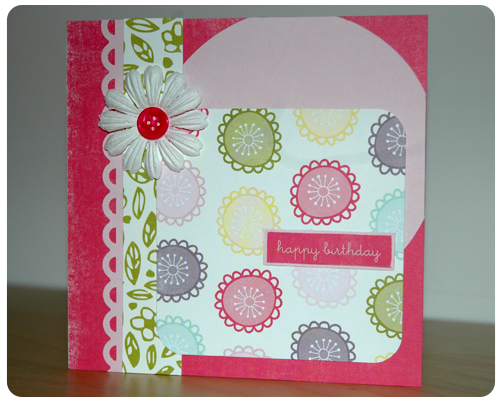 I can easily look for a specific colour of cardstock to match a layout or card. 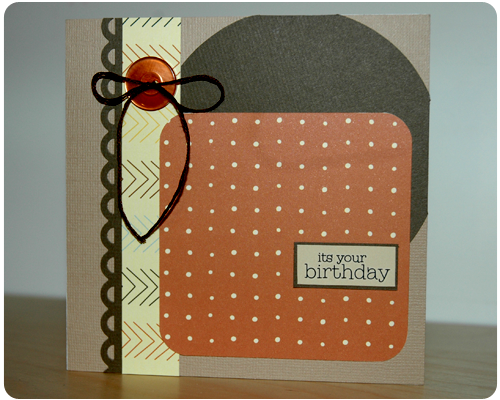 Selecting patterned paper and coordinating cardstock for a card is a breeze. It is neat and organized. What do you do with all your paper scraps? There are so many techniques to try and products to use in the paper crafting world that it is easy to become overwhelmed by all the cool things that you can do. And I love to try new techniques and play around with new product as much as the next girl, don’t get me wrong. But when it comes to card making I try and stick to the idea that Simple is Best. I made a card for a friend a few years ago that was just crammed full of patterned paper, embossing, stamping, and embellishments. As a result, the sentiment was completely lost and the card was so heavy and bulky that it did not stand properly on my friend’s mantel – in fact it fell off and was ruined when her cat started playing with it. After that I decided to tone things down a bit, and keep it a little simpler. 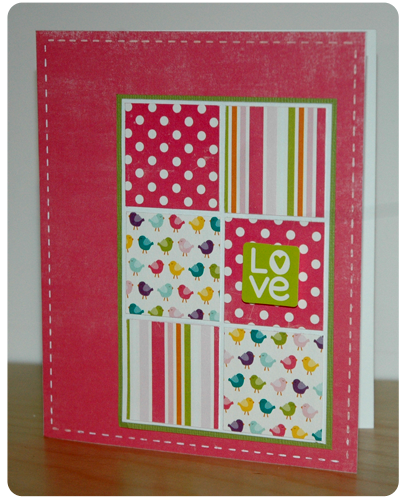 While there are several patterned papers on this card, the squares are small enough to keep the card from becoming too cluttered. There is plenty of ‘white space’ (well, pink in this case), to rest the eye, and the sentiment is clear. What do you think – is simple best? This weekend my family gathered at a local Chinese restaurant to celebrate my Oma’s and Opa’s birthdays. Their birthdays are only days apart (so sweet!) so we celebrate them together. To mark the occasion, I made them ‘his’ and ‘hers’ birthday cards. The design is identical for these cards, but by simply changing the paper and the embellishments, I had one perfect card to give my Opa and another perfect card to give my Oma. I often use this simple trick when I am making cards – use the same design for multiple cards, but change the details: the color pallet, the patterned paper, the embellishments, the script of the sentiment. This way I can create one design that I love and simply change the embellishment from a flower to a button, or the patterned paper from floral to stripes, in order to tailor the card I am making to the occasion and to the person it is intended for. This approach makes things easier and quicker when I have a slew of cards to make. I am sure that other card makers do the same thing, especially if they are looking at sketches. Do you ever create one design and reuse it over and over, simply changing the details each time to create an entirely new card? I recently finished off a project that has been on my list of "Things to Do" for quite some time. 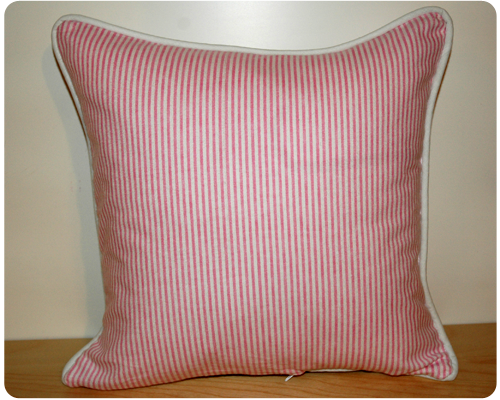 I made this 14x14 pillow using leftover flannel from little blankets that I made for my daughters' doll beds. 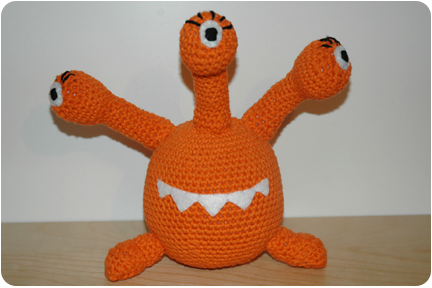 When it was done, I propped it up, stood back, and thought to myself "It's done, but it needs something more." With scrap fabric and random buttons in hand, I made fabric flowers following this tutorial from The House of Smiths http://www.thehouseofsmiths.com/2010/09/fabric-flower-tutorial.html. For the petals, I used scraps of striped flannel (the same as I used for the pillow back) and scraps of white flannel. 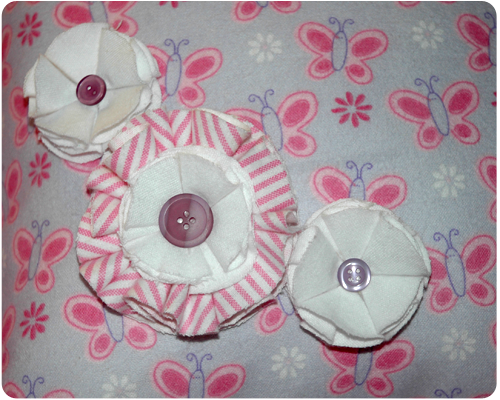 Coordinating buttons finished off the centers of the flowers quite nicely. The flowers were so easy to make. 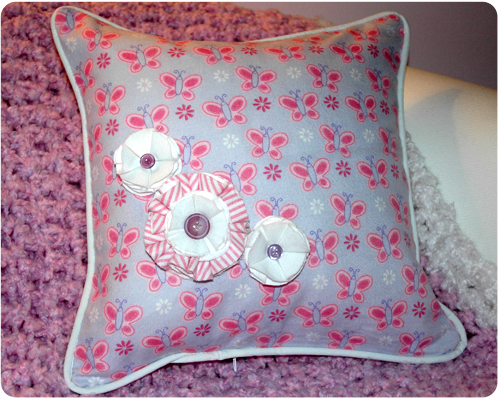 To attach them to the pillow I just tacked them down using sewing thread. 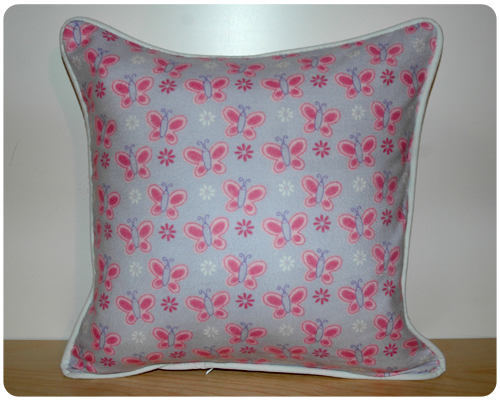 They are the perfect 'something more' that my pillow needed to take it from done to detailed. And here she is all finished up and sitting on the chair in my daughter's bedroom. Wouldn't these fabric flowers look amazing on a picture frame, a lamp, the cover of a scrapbook album, a tote bag? How would you use these flowers to take your project from done to detailed? I am so tired of winter right now. The grey, the rain, the snow and especially the cold. So when I sat down to make this week's card I thought a little spring-infusion would help with the winter blahs. Something with flowers and bright, cheerful colors. Does this make you think of spring? I put it in this place. I'm so glad that it's mine. A smile is on my face.